Hello to all. My name is Austin, I’ll be giving y’all a brief history of my time learning and practice trading Binary Options. After the intro I will be writing about my trades and trading decisions each day I trade to help myself keep a record and to hopefully aid new traders in their journey. I placed my first demo account trade with 24Option 6-21-12 so I’ve been learning and practicing the markets and trading for roughly 4 months. Before that date I haven’t had any practice or knowledge of the markets and I actually stumbled across binary options because I was searching the net for ways to make some money on the side in addition to my regular job. To be honest the reason it caught my eye was because It looked simple to execute a trade (which it is), but I also had that mindset that it would be a “get rich quick” kind of thing ,and I of course fell for it in the beginning. One thing I can say is it is NOT a get rich quick scheme, and many new traders think of it this way and end up blowing account after account. When I realized that it was going to take more work to be good at this, I started researching more and more and I thought to myself, wow, this really is going to be REALLY hard to become good at. It doesn’t help me that I had no prior knowledge of the markets, since I had to step back and start learning about different market terminologies and the ins and outs of each market. So I spent, and currently am spending, a lot of time researching the Forex market from various forums and websites that teach newbies what it’s all about. I currently have several books I have read and still reading so I can wrap my head around trading. One thing I know is that I find great encouragement to continue learning when I look at other traders that are successful and making great money doing what they do. Some days I just feel down about trading, and I’ll go and read a post from someone that is doing great and it can turn my day around. I know one day I want to be like them and I want to make money as they do. When you go into trading, you cannot be negative, you have to be positive and believe you will be successful at this. So up till now, I am still demo trading and improving my knowledge and honing my skills. I have yet to become profitable and I will not trade a live account until then. I have an account with 24Option and Markets World, which are my two favorite Binary Option brokers. Currently I am tweaking my strategy to what works best for me and helps me see potential trades more clearly. My strategy I use is based primarily off Price Action, which I believe to be the best way to learn how to identify trades regardless of time frames. I also use various other indicators, but they are only used for confirmation purposes. Right now I am primarily focusing on AUD/USD currency pair as it trades best when I can trade, which is after I get off work around 4pm- 10pm. Occasionally I get up at 4am and trade the same pair as its more active then than in the evening. I do look at other pairs occasionally just to see what they are doing and sometimes place a trade with them. So I will be going over my three trades I had earlier in the week, particularly 10-10-12. I managed 3 trades that night, 2/3 ITM. My first trade spawned after i noticed a nice ascending triangle forming a couple hours ago. So I waited for the triangle to narrow, and I drew a line showing that price was ascending up. Ascending triangles are very reliable because there’s usually is a sharp move up in price after the triangle moves together. After I watched the triangle for some time, there was a Doji that formed. Since the overall trend was up for quite some time and volume increased for the previous bars i placed a call. I had three things going for me here, the ascending triangle, the Doji, and the volume spikes, so it was likely price was going to break out up. 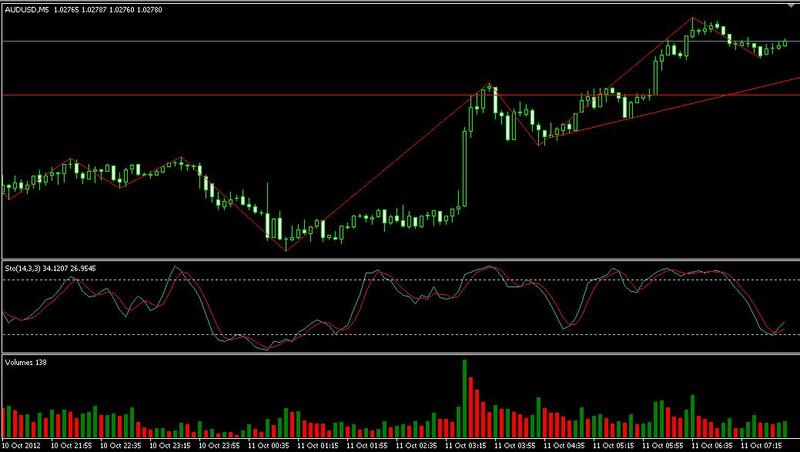 My second trade i waited for a pull back from the strong uptrend. Price dipped back down and there was a spike in volume around that area, and on the 1 minute time frame the stochastic was beginning to cross over, there was also a hammer that formed on the 1 minute time frame that added to the probability of price moving up. Both my first trades were large winners. My third trade wasn’t so great, and I placed a call when clearly price was being rejected around 1.02830, and I wasn’t following my rules then. Lessons learned. As I said earlier, I’m still honing my skills and trying to improve my strategy. 2/3 trades ITM is a good day for me, I’m trying to improve the trade quality I pick and reduce the amount of bad trades. There really is a lot of psychology involved with trading. I’ll be updating each day I trade. Best of luck to all!